This easy-to-construct Casita screen house from Kay Home is 90-percent preassembled for quick and easy set up. Adds 162 Sq feet of stand a-lone three season living space to your backyard, summer cottage, travel trailer or campground. 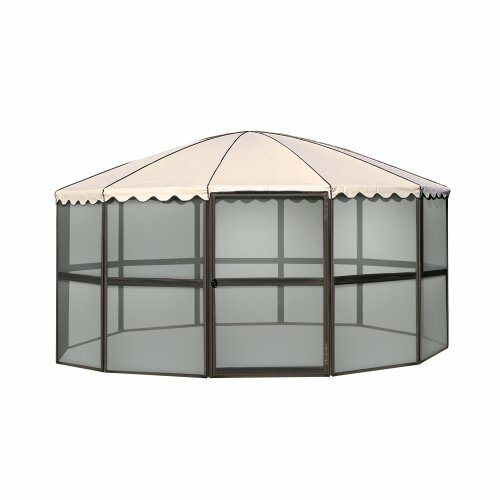 The Brown screened frame features an Almond roof constructed of 3-ply vinyl that resists mildew and grommets that prevent water pocketing and sagging. Rustproof fiberglass screens allow air to circulate while keeping out flies, mosquitoes and other annoying insects. Standard swing out door is hinged on the right hand side and can be positioned anywhere. There are 12 panels each is 45-inch wide by 74-inch high. Fully Assembled: 11-feet 7-inch Deep by 11-feet 7-inch Wide by 8-feet .8-inch High with a center height of 8 ft. 6-inch. The support bar, at the halfway point, on the inside of the screen panels provides panel stability while the top and bottom are held stable with a patented cable retainer system. Heavy-duty galvanized cold rolled steel frame with baked-on architectural finish resists fading and oxidation. Roof is detachable for easy maintenance, storm removal and winter storage. The screen house itself has a simple fold-down capability allowing for easy storage during the winter. Instructions, anchor bracket kit, threshold included. Adds 162 Sq feet of 3 season living space - 90-percent preassembled for stress free set up . Standard swing out hinged door on the right hand side and can be positioned where you choose. If you have any questions about this product by Casita, contact us by completing and submitting the form below. If you are looking for a specif part number, please include it with your message.